Thanks go out to Touchstone Publishers for sending a complimentary copy for a Feast of Sorrow book review. Friends, Romans, countrymen, lend me your ear! 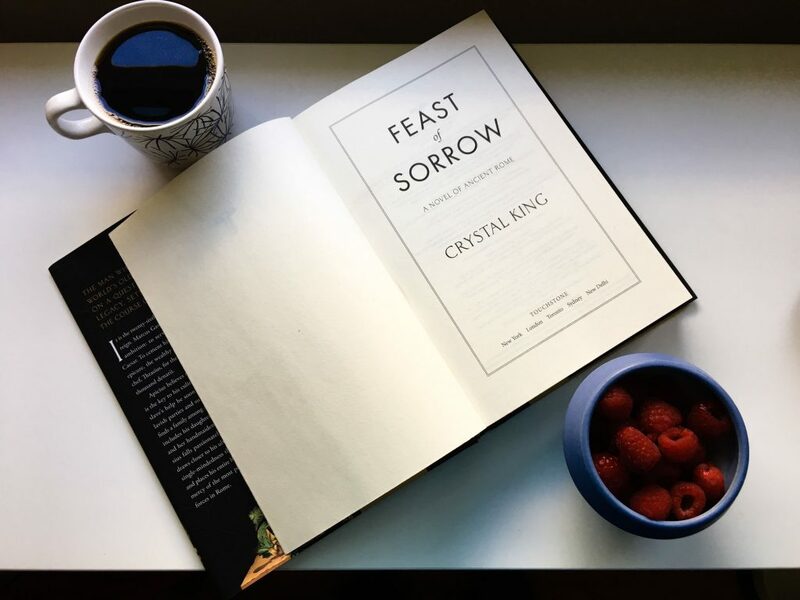 It may seem cheesy to start with this widely known adage, but the world in Feast of Sorrow by Crystal King so completely transports the reader to ancient Rome that you begin to wonder what color stola you might wear and start to rue the extinction of the herb, silphium. 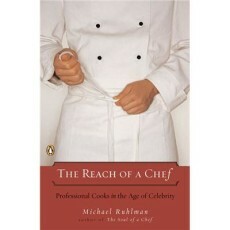 The story centers around the kitchen of a “vulgar rich patrician” Apicius and his cook, Thrasius that propel the reader into Roman intrigue, cultural mores and a dizzying collection of recipes (Roasted Peacock, anyone?). Historical fiction hinges upon an answer to the question, what if? King qualifies in her author’s note that a cookbook with Apicius’ name on it is the oldest known collection of recipes. So, in the midst of the story a cookbook is penned. I had worried for a moment that the book would be one-sided with an overwrought hand as sometimes food stories can gluttonously go. Instead, King offered deeper understanding of the culture such as fashion cues of patricians or the politics of relationships with the food as accent. I confess I found fascination in these bits almost more than the food. What I appreciated about the book is that I wasn’t looking for cliffhangers or climaxes, I let the tale take me from one city to the next, from how slaves were purchased during the Roman era and even how they might be released. The book transfixed me in the satisfying way that makes being a reader pure pleasure. From a craft standpoint, you could tell King had done a tremendous amount of research, whether it was locating the appropriate recipe method to open each section or uncovering the proper way of people addressing each other. 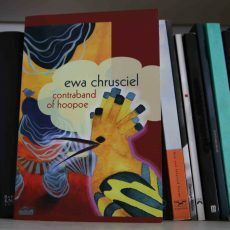 Recently, I had a chance to connect with the author (isn’t that every readers secret hope?) to learn more about what brought this story to life. One quick note, tread carefully below. SPOILER ALERT! I’d encourage you to read the book and then circle back to the interview for insights. 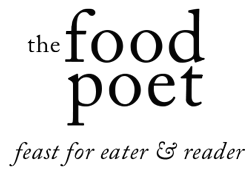 THE FOOD POET: What sparked you writing this story? 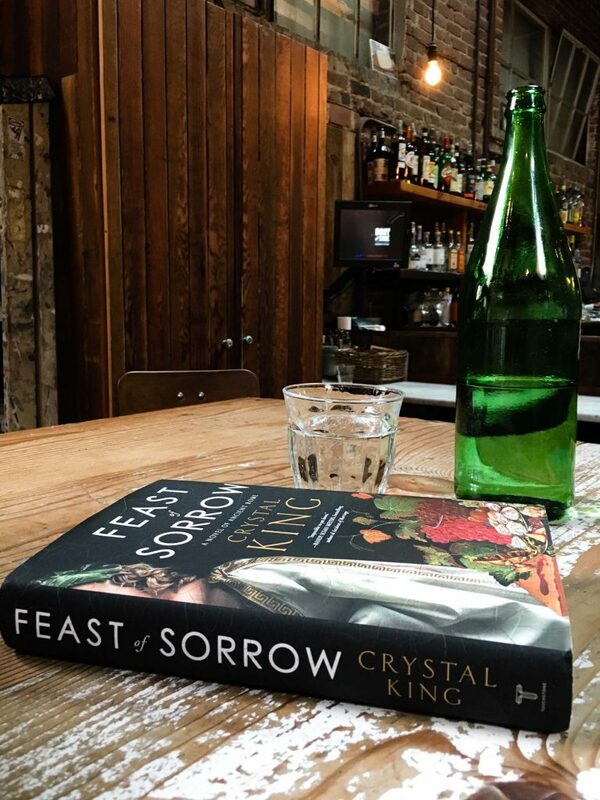 CRYSTAL KING: I was writing a different book at the time but I had read a line (I love food books and food memoir—it’s always been a passion of mine) about Apicius and how he died in a crazy way. I wrote a scene where Apicius received the knives. As I was writing it, I ended up thinking that was a better book. I’ve always loved ancient Rome. TFP: How long did it take to research and write this story? CK: Writing and research was about three years. It took about three years to find an agent—it’s been about a decade for the whole project. TFP: Where did you go to find primary sources for your research? CK: When I started to do research, I realized there were a lot of people who are obsessed with ancient Rome. I spent a year or more reading everything I could get my hands on. I would read Virgil, Cicero, Marcus Aurelius, Cato the Elder, Pliny the Elder – natural history – how people in ancient Rome thought about slavery, how slaves were treated. There’s so much information that made it through from those times. I also visited Italy eight times. It changed the physicalness of the book – like where they had to walk through the forum to get to the stairs. Where the market was, where you bought the fish. I could walk where the characters would have been. TFP: The relationship between Apicius and Thrasius is a complex lens into slave masters and slaves in ancient Rome. What inspired you to take this approach in telling the story? CK: I wrote the first 15 chapters four times from four points of view. There wouldn’t be any surprise in the ending if I told it from Apicius standpoint. I wanted to resist first person—so many historical fiction books are told this way. I wanted the reader to be wondering about Apicius and could do more with food, the preparation and serving of it, by telling it through Thrasius. Apicius is on a tragic path—I needed a balance for that / someone the reader could get behind and a character that could give you insight into Apicius and could understand him in a way. TFP: How did you decide what recipes would open up the sections? CK: I had an agent interested in working with me on this book. Originally written in historical fiction fashion with dates at the tops of the sections, she felt the dates slowed the reader down. How do I manage time, so the reader isn’t confused if they skip years? I decided to section it out based on the chapters of the Apicius books. TFP: Did you make up many of the foods Thrasius cooks in the story? 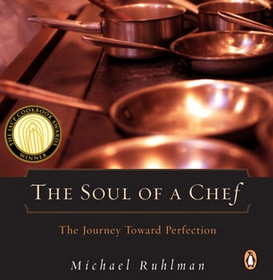 CK: All of the food in the book was real—directly from the cookbooks. There were foods not from Apicius’ cookbook but from other ancient Roman cooking. They ate silphium all the time in the food but it was also used in birth control. Med researchers are trying to understand what it was in that root to control unwanted pregnancies. TFP: There’s a Downton Abbey-esque feel to the book, especially in the beginning–how did you feel out how much of this is Thrasius’ story versus Apicius’? CK: In the first draft this is Apicius’ story. As my early readers and writing group workshopped it, they kept asking, “whose story is this?” As Thrasius is telling the story, it’s about him. Early drafts I struggled with that. It’s a story about the whole family. That’s when I started to add more about Passia and Sotas. That’s when it took on a different life. TFP: I always wondered how Apicius made money– he seemed to run through it quickly! CK: Early on, Apicius’ father had left him a ton of money. What patricians would do is they would make trade deals, buy land, or they owned farms, salt mines—I wanted him to not care about any of that. TFP: The fate of women was also very stark in the story– theirs seemed like a different kind of slavery. CK: The women are all very marginalized in a lot of ways. The book cover from the publisher originally depicted romance but we worked to find something better. This story is not a romance, not about the women, and it’s also a good reminder of how far we have come. These women were owned by their husbands, who they married and who they didn’t. I wanted to make them strong characters with some personality but they couldn’t go so far. Apicata was married to Sejanus in real life. Apicius did sleep with Sejanus early on.